On the night of 9th July 1988, the North Sea oil production platform Piper Alpha exploded. Owned and operated by Occidental Petroleum, Piper Alpha was the largest oil and gas platform in the area and provided employment for 228 workers. The explosion, a result of lax safety procedures, set off a chain reaction, engulfing the platform in flame and quickly tearing it to pieces. 167 men died as a result of the explosion with many of the 61 survivors having braved a 100ft drop from the helicopter platform into a burning sea. But up until this morning, I didn't know any of that. I had some hazy knowledge that there was a really bad disaster on an oil rig sometime in the 1980s, but had no idea of the specifics. So, if nothing else, Tom Cooper's Part of the Picture has provided a useful education to me about a disaster that seems all the more relevant in the light of the Grenfell disaster. Part of the Picture is docu-theatre, but broadly follows the story of Sue Jane Taylor (Charlaye Blair), a Scottish artist with a focus on workers and industry. She considers the sudden eruption of activity in the North Sea oilfields an important part of cultural history that must be chronicled. And so, after finally convincing a PR man, she ends up on Piper Alpha, sketchbook in hand. 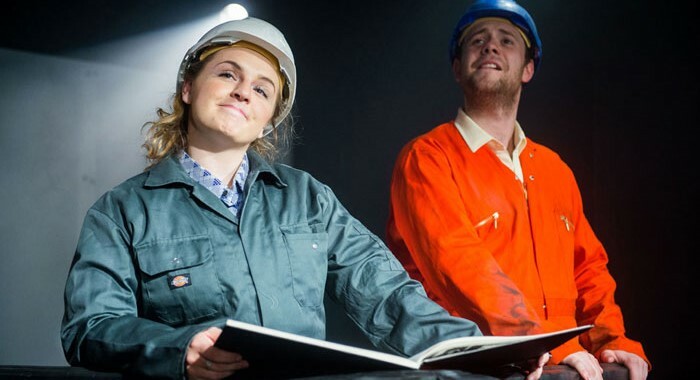 Here she meets roustabout Jim (Ross McKinnon) and crane operator Robbie (Brian James O'Sullivan) and, after some initial scepticism from the all-male crew, she sets to work sketching them. A year later she's preparing for an art exhibition on industrial workers when she hears the awful news and realises that many of her subjects have perished in the disaster. This is a precisely told and extremely touching story, the product of careful research and interviews with all manner of offshore oil and gas workers. Cooper approaches the men of the Piper Alpha with respect and sensitivity, communicating everything from the difficulty they have being separated from their families, the problems that arise in a testosterone-saturated working environment, their precarious employment status (shackled to global oil prices) and the simple day-to-day experience of what it's like to work on an isolated platform in the middle of the ocean. Within this environment, the three performers excel. Blair is great as the inquisitive, passionate artist who understands the necessity of understanding the industrial world and technology through art - visibly toughening up as she emulates the sturdiness of her subjects. But it's McKinnon and O'Sullivan who provide the heart and soul of the piece. O'Sullivan's Robbie is a lively presence, keeping his travelling disco on the road when he's not at sea. For my money it was McKinnon who most embodies the stoicism of the offshore worker, recounting his own death with a weary, tragic pragmatism. My one criticism is that we never get to see any of Sue Jane Taylor's work in the piece. I'm guessing there was a rights issue preventing this, which is understandable enough. Still, when we spend so long watching her create her portraits it's a bit of an anticlimax to see them represented by blank picture frames in the finale. The play concludes with the pointed message that while this industry takes place hundreds of miles from land where nobody is watching, we're all a part of it. From petrol to contact lenses, our cossetted lives are made possible by lonely men in dangerous jobs. Part of the Picture movingly memorialises those that lost their lives in Piper Alpha, as well as reminding us to be thankful for the danger their contemporary counterparts face every day. Part of the Picture is at the Pleasance Dome, Edinburgh Aug 10-13, 15-28. Tickets here.